In turbulent economic times, the property investment market is often seen as a solid investment—and although the recession is supposed to be over, the European migrant crisis, the prospect of Brexit and weaker global demand has given the money markets the jitters. So what’s the current outlook for property investment and are bricks and mortar really a safe haven for your capital? It seems like, financially speaking, we’re still being buffeted on stormy seas. Global demand is falling, oil prices have crashed and money markets around the world are volatile as they watch growth slowing dramatically in the Chinese economy. In the UK, economic indicators haven’t performed as well as expected, but that notwithstanding, we’re still one of Europe’s strongest. In the rest of Europe, cheap credit and a continued, though slow, recovery in the Southern European countries are also tempting investment. So, given this situation, where should the canny investor be directing his money? In 2015, £71bn worth of property trades meant market activity was up 12% on the previous year, a sign of strong capital growth particularly in the commercial sector. Britain continues to attract overseas investors, though activity has been slowing down over the last quarter. This downturn can be seen as a reflection of the concern over the EU referendum. The smart money says that once it’s out of the way, and assuming the UK doesn’t make a shock decision to desert Europe, there should be a recovery later in the year. Taking a longer view, the prospect of interest rate rises and improved financial stability will allow for property investment with an eye to income production. Investors are increasingly looking for rental growth and the ability to increase value through refurbishment and redevelopment. Even with a reduction in activity on last year’s levels, property will still outperform other investment assets, making it an important element for a balanced investment portfolio. For this reason, the majority of pundits expect investment demand to remain strong, with a rise in the focus on longer-term asset management for ongoing income. To summarise, choppy economic waters are keeping property at the forefront of most investors’ lists, and even a long-overdue rise in interest rates will have a negligible effect on commercial property yields as rents are also rising. Furthermore, with development finance still cheap, the best commercial performance is expected from active asset-management and selective development. 2015 ended on a high in the European property market with nearly €96bn invested in property in the final quarter. Despite its difficulties, Europe still represents one of the world’s economic power houses, and this figure represents a 16% increase on 2014. While London remained stable, Berlin and Milan experienced big rises, and Madrid also came on strongly. Losers over this time period were Amsterdam and Dublin. France also experienced increased investment growth in 2015, mainly from domestic investors, while in other European markets foreign investors dominated. At the same time, the German market for commercial real estate has soared. Additionally, the Scandinavian capitals—Stockholm, Copenhagen and Oslo—put in strong showings in the commercial markets. Across Europe, investment in retail property is currently buoyant and office space continues to be in high demand. The result of this is downward pressure on prime yields, making it a market for the medium and longer term investor who can afford to wait for interest rate rises. 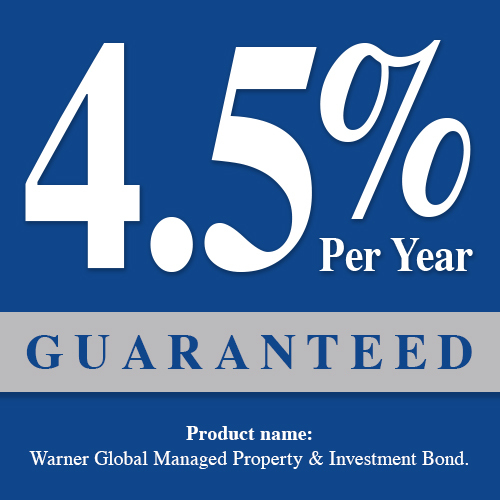 If you’re interested in protecting your capital in a property-focused portfolio, the new Warner Global Property & Investment Bond is the solution.